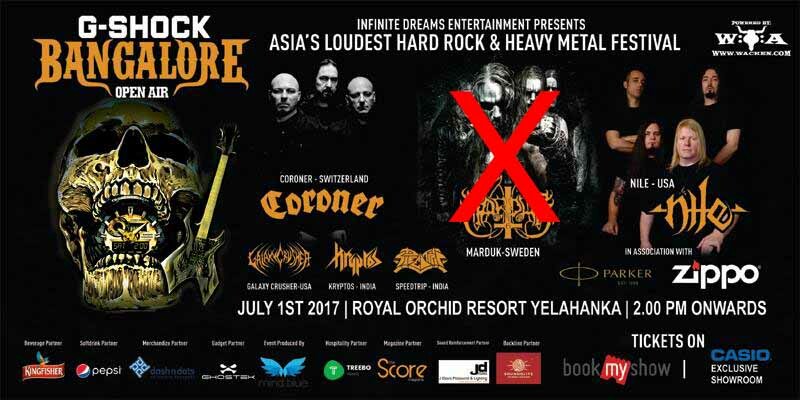 Even as all is in readiness for the 2017 edition of the Bangalore Open Air festival, set to take place at Royal Orchid Resort Yelankha in Bangalore, India on Saturday July 1st, the festival organizers have had to come out with a difficult announcement, just two days prior to the event. Swedish black metal band Marduk has been dropped from the lineup because of failure to apply for their visas in time. Read the full statement from the organizer below. Bangalore Open Air is powered by Wacken Open Air, and held its inaugural edition in 2012. The festival has been organized in Bangalore every year since then, bringing some mighty fine international bands to India (Kreator, Iced Earth, Dark Tranquillity, Animals As Leaders, Destruction, Rotting Christ, Napalm Death and Vader to name a few) and giving Indian bands a chance to share the stage with them. The remainder of the 2017 lineup features international acts Nile, Coroner and Galaxy Crusher along with Indian bands Kryptos and Speedtrip. “We have an important announcement to everyone coming to Bangalore Open Air and to all metalheads in general. As you all know we were extremely excited to bring Marduk down to Bangalore for their first ever appearance on Indian soil. However, we have been left appalled at the band’s utter lack of professionalism, as well as their complete disregard for stipulated and agreed-upon deadlines. After repeated efforts, multiple emails and weekly reminders from our end, the band’s management still failed to apply for visas, citing a busy schedule among other questionable excuses. On June 22nd we were informed that a member of Marduk apparently ‘lost’ his passport. We were then assured that a new passport was applied for and the process would take 2 days, following which the visa would then be applied for. However, there has been no sign of the passport until today, which has left us extremely angry, frustrated and let down, especially considering we did everything in our power to get the band down to India. Due to this, we have been left with no choice but to remove Marduk from the 2017 edition of Bangalore Open Air on account of the band’s constant dithering and lack of professionalism. While the festival hasn’t been without hiccups in the past, we ensured that everything would be carried out as smoothly as possible this year. But, in spite of coming to an agreement with the band almost 2 months ago regarding their performance in India, we have been left high and dry by the band and their management. The sole responsibility for this lies completely with Marduk and their management for not applying for their visas well in advance. It displays a severe lack of consideration for the incredible amount of hard work we have put into this festival and an utter lack of respect and appreciation for their fans who have been waiting in good faith for Marduk’s debut Indian performance. Every single email, message and chat between us and the band and their management has been documented, should the need arise to vindicate our position. We would like to apologize to the fans who were eagerly looking forward to seeing them in the flesh. However, we sincerely hope you will continue to lend your support towards making this year’s festival the best it has ever been. We have been working tirelessly to bring some of the best bands around the world right to your doorstep, and we are as disappointed as you are with what has taken place.